Click HERE for results of Draw No 4 held last evening. Final draw takes place on Tuesday 8th August. Congratulations to all the winners and thanks to all our sellers and supporters. Next Draw takes place on Tuesday 22nd July. For Results of Draw 2 click HERE. Next Draw takes place on Tuesday 8th July. Last night in Piltown the first winners were drawn in the 2014 Draw. Click HERE for full list on winners. The second draw takes place next Tuesday night June 24th. Kilkenny GAA congratulates all the winners and thanks all those who sold and purchased draw tickets over the past few weeks. The first draw has been postponed to Tuesday next 17th June. 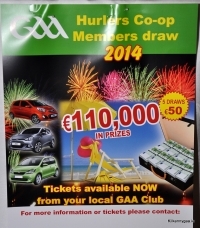 Tickets for 2014 Hurler's Co-Op Draw are now on sale all around the county. There will be over €110,000 in prizes over the five draws with tickets costing €50. This is the main fund-raiser for many of our clubs and supporters are encouraged to again support the venture as they have done in the past. Click on Read More below for photos from the launch courtesy Willie Dempsey and full details of prizes and draw dates.